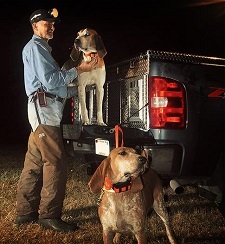 Bushwhacker LED Headpiece for your 21-24 volt belt lights. This light head will work with your existing 21-24 volt belt. This is an upgrade over previous generation belt light heads producing 1400 lumens of brightness. This head has unbelievable brightness and a really tight spot. Comes with red color modules. Other colors (green, amber, blue, or white) available by request.